The archaeological site of Chavín de Huántar sits at an elevation of 3,177m (10,425ft) above sea level in the Peruvian Andes and is located at the confluence of the Mosna and Wacheksa rivers. 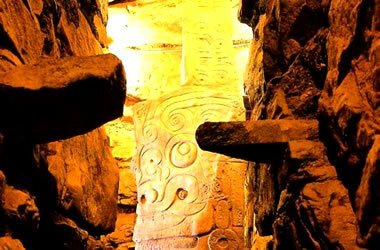 Chavín once intersected several major trade routes through the Cordillera Blanca mountain range, a strategic location for the capital of the Chavín civilization. 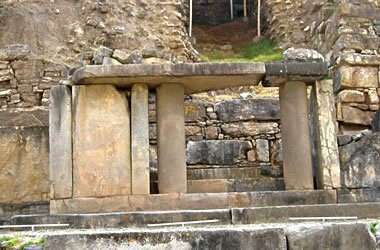 The site is located near the Callejón de Huáyla Valley where the village of Chavín de Huántar is located. Chavín is now served by a recently-upgraded, asphalt roadway. Covering 12,000 sq m (129,167 sq ft), the site includes massive temple structures with significant interior and subterranean space, pyramidal platforms, courts, and sunken plaza spaces, most of which are aligned on a common axis. Over time, river floods have eroded much of this stone architecture; its mountainous location has also made it susceptible to destructive landslides (as recent as 1945) and earthquakes (as recent as 1970) over the centuries.